The Business Office is dedicated to supporting the mission of Lick-Wilmerding High School by providing effective and efficient financial and human resource services, with integrity, creativity, flexibility, respect, confidentiality, and professionalism. The Business Office team strives to provide friendly and personalized assistance for all the various members of the School Community and its partners. The Business Office provides many services to students, families, faculty and staff while supporting the administration of the school's finances and human resources needs. Services provided to students are the purchase and distribution of school textbooks, supplies, BART tickets and the administrative support to the food service program. Students routinely visit the Business Office, upstairs at 27 Howth Street, to purchase tickets, add monies to their food account, and inquire about these services. For related questions please contact Emily Fung, Accounting Associate, at 415.333.1406 or by email at efung@lwhs.org. Youth age 5 to 18 can apply for Youth Clipper Card and receive 50% BART fare discount, other transit discounts, and also avoid BART and other transit system surcharges. Eligible students age 13 to 18 can still use existing paper Bart Orange Tickets, but will have a ticket surcharge. Riders are encouraged to get the applicable Clipper card to avoid the surcharge. For Flex families, LWHS is offering to help with the cost of riding BART for students enrolled in the Flexible Tuition Program. Funds will be added to a student’s youth clipper card twice a year, in the beginning of Fall 2018 and beginning of Spring 2019. Parents/Guardians must fill out the Bart Registration Form. Note: this form is kept on file and a new form will need to be completed each year. Students will make an appointment with the Business Office beginning September 4, 2018 (first day of school) to schedule a time so the funds can be added. Please email Financial Aid Officer Emily Fung to make an appointment. Please bring your login information and youth clippercard to the appointment. (Students will log into their youth clipper card account during the appointment, and the Business Office will be able add the funds directly to their account, as well as view receipts and records. If you have any questions regarding the BART program, please contact Financial Aid Officer Emily Fung in the Business Office. 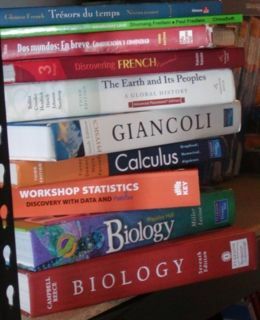 Textbooks are included in tuition and distributed during Bookstore hours before the start of school. If you are unable to pick up your books during the scheduled time, typically announced in the summer newsletter, you may come to the Business Office on the first day of school, from 3–5pm, Monday–Friday. For special circumstances, please email Cynthia Yu for assistance. If your class schedule has changed or is different than the one we are working with and you need to exchange a book, simply bring the book(s) you wish to exchange up to the Business Office with proof of schedule change from Registrar Kelleigh Trowbridge. Without proof of an authorized schedule change, books cannot be exchanged or returned. There are no exceptions. If you are dropping a class and have received books you will need to return those books immediately or you will be billed for them. If books are not returned and the bill is not paid the school will take serious action to replace the missing materials. If books are lost or stolen, they will not be replaced but they may be purchased from the Business Office. More information will be provided when textbooks are distributed. The day before Frosh Orientation is set aside for 9th graders ONLY textbook distribution. Although the books are given to you in a paper bag you might want to bring your backpack to school on these days. You may also go throughout the rest of the week, same time, same place as returning students, but it may be busier because all students can get books then. Please click here to access the internal HR page. If you are not already logged in, you will be prompted to enter your username and password. In an effort to improve efficiency, LWHS has contracted with FACTS, an automated tuition management system to provide tuition billing and collection services. To find out more about FACTS, please contact Emily Fung at 415.333.1406 or by email at efung@lwhs.org.